Ask CF: How Do I Wear a Full Circle Skirt? How do you wear a full circle skirt? Do you have any outfit ideas for inspiration? Thank you! While full circle skirts are usually associated with the infamous “poodle skirt” of the 1950s, this silhouette has recently made a huge comeback in fashion. There’s something so fun and flirtatious about a full skirt (and twirling around while wearing one isn’t half bad either), so it’s no surprise to us that this style has been revived. The trick to styling a full skirt is balance. Since the skirt is full on the bottom, you want whatever you’re wearing on top to be more streamlined and cut close to the body. Look on for three different outfits that I created for inspiration using three different full circle skirts of various lengths. I hope you find these outfit ideas helpful and inspirational. Thank you for your question! For this look, I started with a full knee-length skirt in classic black. Next, I added on a bow blouse that I would wear tucked in. For a topper, layer on a sheer printed kimono; while the silhouette is more billowy, the lightweight, delicate piece won’t overwhelm. Some polka-dot tights, pretty pink flats, and a gold charm bracelet add the finishing feminine details. While full skirts of the longer variety are very popular, the shorter versions deserve some attention as well. I especially love this plaid one for fall. I wanted this outfit to be more casual and less girly, so I paired the skirt with a varsity tee and contrast sleeve denim/faux leather jacket. Throw on some opaque black tights and your everyday Chuck Taylors and you’re set to go. This final look is perfect for class, date night, or even a holiday party. The star of this outfit is definitely this beautiful printed midi-skirt. Since I wanted the skirt to take center stage, I added on simple pieces like a turtleneck pullover and bow belt. 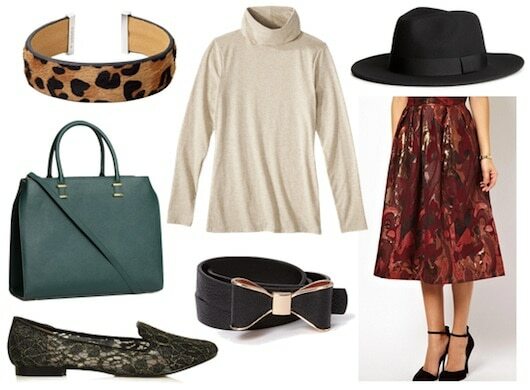 A structured emerald bag, a leopard cuff, lace flats, and a felt hat complete the ensemble. What do you think of this Fall 2013 fashion trend? Do you have a full circle skirt? Do you like these outfits? Which one is your favorite? How would you style this trend? What is your favorite silhouette for a skirt? Please let us know what you think by leaving a comment below!